Railroadfan.com • View topic - Traverse City to Leelanau Co.
Traverse City to Leelanau Co. I've been doing some research on the line that ran North out of TC. There are numerous references to "Rennie Station" where the line started, then went on up to Suttons Bay and Northport. Anyone know where this place was? Re: Traverse City to Leelanau Co.
Michael thanks for the foot work on that answer. Interesting articles. I was up there a couple of years ago and seem to recall some rails still in the ground near an old depot. Is that in Northport or am I thinking of somewhere else? J T wrote: I was up there a couple of years ago and seem to recall some rails still in the ground near an old depot. Is that in Northport or am I thinking of somewhere else? Northport. Was working near Suttons Bay this week and went to Northport Wednesday evening. Rails sticking out of ground where they would have crossed a creek just north of the station, now a residence. This line is now a very nice paved rail trail from downtown Traverse City to just north of Suttons Bay. Last edited by SW on Sat May 28, 2016 9:02 am, edited 1 time in total. I can't guess where you might have see rails. A greedy contractor was salvaging every inch of those rails in the mid 80's. Northport had developed a park green area over the ROW and this guy wanted to carve up the place just before a 4th of july celebration. They had to get a court order to stop the operation that would endanger the public during the event. He later returned to finish the job. Northport later paved over the area for a marina parking lot. The ROW in Suttons bay is completely paved over the entire town except a small area around the depot. Maybe that is where you saw something. Nope. Northport. See above. I cycled (and jogged) around Suttons Bay and I didn't see rails anywhere, except just north of town where the grade crossed M-22, and there were some rails still in the pavement. If there were some by the old Suttons Bay depot, I somehow missed them. I remember the other rails that were still running up to the Northport station and went looking for them when I walked around the park the other night. When I last saw them in 1979, they were in danger of being buried in the grass, and I figured they were underneath the surface now after all these years, as there was no trace except by the creek, or removed. Now I know the rest of the story! When I was there in '79, a local told me the last train there was about 10 years before, and other sources have said last train there was 1968. Last edited by SW on Sat May 28, 2016 9:17 am, edited 2 times in total. SW wrote: Rails sticking out of ground where they would have crossed a creek just north of the station, now a residence. Wow, nice find. I wonder how those got left behind. The following information was taken from the Pennsylvania Railroad Technical and History Society web site http://www.prrths.com/PRR_Default.html – PRR Chronology by Chris Baer. Northport-Manistique, Mich., car ferry revived. Northport-Manistique, Mich., car ferry discontinued. Whereas, it is diemed desireable by this company to negotiate contract for, or construct and build at Northport and Manistique such docks, slip, racks and approaches as may be necessary for transacting the business of this company, therefore be it. Resolved, that R.R. Westbeauy, President and D.W. Kanfinau, Vice-President, are hereby authorized on behalf of this company, to contract for, negotiate or construct and build such docks, slip, track and approaches upon the property of this company at Northport and Manistique as may be necessary to transact the business of the company, with full power and authority to pay for same out of the funds of this company. Resolved that this company accept said leave and hereby authorizes its President and Secretary to accept said lease on behalf of this company accordingly. 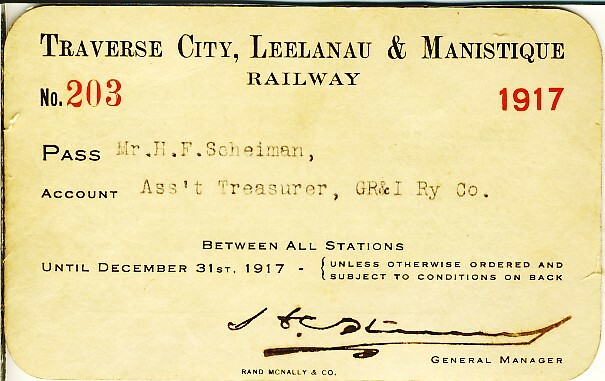 Whereas, the Traverse City Leelanau and Manistique Railroad Company, a railroad corporation organized and existing under and in pursuance of the laws of the State of Michigan, desires to enter into a contact with this company agreeing that it will not engage in carrying on a car ferry and transfer business by water and will not make or enter into any contract with any person, firm or corporation for or in relation to the transportation or transfer of freight or passengers by water without the consent of this company, and it being desired for the best interest of this company to accept said offer and enter into such contract, therefore be it. Whereas, the Traverse City Leelanau and Manistique Railroad Company desires this company to construct certain tracks, side tracks and switches connecting the tracks of that company with the docks of this company at Northport and offer and agrees to pay the cost and expense of same on its right of way to connections with this company's dock tracks, and to perpetually maintain said tracks connections and also maintain the dock tracks and connections of the Manistique, Marquette and Northern Railroad Company, with the understanding that said docks tracks and tracks connections on the property of this company remains the sole property of said Manistique, Marquette and Northern Railroad Company therefore be it. Whereas, this company has negotiated with the Traverse City Leelanau and Manistique Railroad Company for a right of way and easement which it has over, across and upon Third Street (extended) in the platted village of Northport, in the township of Leelanau, Leelanau county and state of Michigan, extending from Water Street easterly to Grand Traverse Bay in said bounty, therefore be it. Resolved that the President and Secretary of this company are hereby authorized and direct to accept and assignment and transfer of said rights and easement. Wow, lots of history on this little line. My own history goes back to when I was younger than smart. I rode my snowmobile from Suttons bay to Northport right between the rails (still in at the time) running over saplings a good part of the way. Some were over an inch dia. that I had to go around. I made it almost to the village when I saw a home owner giving me a stern look. I decided to exit and take the shoulder of the road back. I'm looking for a track layout at Northport, any will help. Here's a pass from this line. If you look in my pics, there are other sections of track left in Northport. They are south of town along South Shore rd. MIGN-Todd wrote: If you look in my pics, there are other sections of track left in Northport. They are south of town along South Shore rd. Ok, sounds good. Where are these pictures? The next two pictures after this one show some rails as well.